What does it mean to be one of God’s chosen? Is it a blessing, a curse, a responsibility, or a privilege? Or is it all of the above? The film The Chosen People? A Film About Jewish Identity, asks these very questions. This movie is an independent effort by filmmaker Joshua Gippin. After getting funded on Kickstarter three years ago, Josh is ready to release his film October 9th, 2017 at the Summit of Faiths during Peace Week in our hometown of Akron, OH. Look for it at a film festival near you. Mike and I got to see a preview of the movie this summer. I am especially excited about this film, because not only did I help fund the movie on Kickstarter, but I also have a small part in the movie itself! Mike and I have also eagerly anticipated the Starz adaptation of Neil Gaiman’s novel of the same name, “American Gods.” I read the book at Mike’s recommendation, and he has not steered me wrong. But does the show stand as tall as the novel? Listen to find out. Next time we will continue our exploration of religions other than Christianity. (We need a break after the massive amount of Christploitation we covered in our last episode!) First up is the French-Iranian animated feature Persepolis based on the graphic novels, and then the Indian television series “Buddha” which is available to stream on Netflix. Until then, shalom. 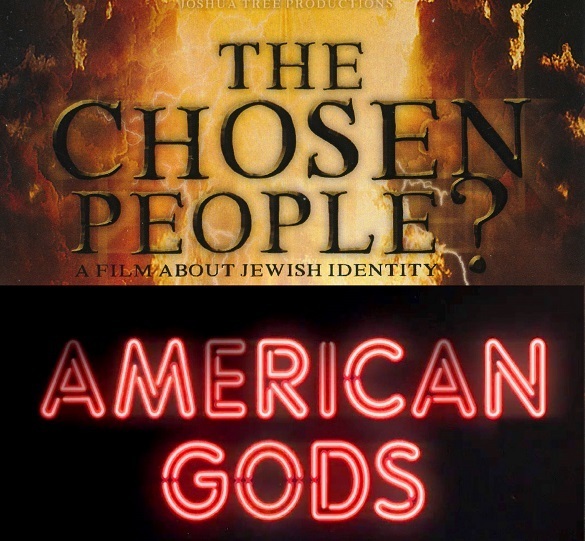 Filed Under: Documentary, Drama Tagged With: American Gods, The Chosen People?